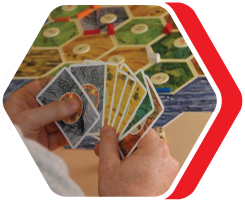 Love competitive Catan but can't make it to our regular state events? Head to the Casino Christian School in Casino, NSW on the Queen's Birthday Long Weekend for the Northern Rivers Catan Championships, run in conjunction with the Australian Boardgaming Tournaments. Who can enter? The Northern Rivers Catan Championships are open to players of all ages and skill levels, so come along and have a go! The winner will receive cash towards airfares to Melbourne for the 2019 Australian Catan Championship (10 August), and will be automatically seeded in the top 16. Please familiarise yourself with the Round Schedule page for details on when to arrive at the venue, round timings and breaks. The 2019 Northern Rivers Catan Championships will be held at the Casino Christian School, 93 Manifold Road, Casino NSW 2470. Please see the map below. Win first place in your tournament to be eligible for FREE entry to the 2019 Australian Championships in Melbourne, plus funds towards airfares and automatic placement in the top 16!